You can easily share Mer Soleil with up to four other couples or the whole family, with five king-sized beds in private bedrooms with ensuite baths ensures privacy. The kids will love the large pool, while you sit nearby sipping a drink in padded lounge chairs, overlooking the tropical waters below. Restaurants and grocery stores are not far away and neither is Baie Longue Beach. You aren’t entirely secluded, though, and the villa does provide privacy when it is wanted because of its hillside location. You can enjoy the tropics without giving up any of the comforts of home. There is a gazebo kitchen, comfortably furnished living room, and enough seating for everyone. Mer Soleil sits on Terres Basses’ hillside and stuns with sunset views of the Caribbean, La Samanna Hotel and Baie Longue Beach. 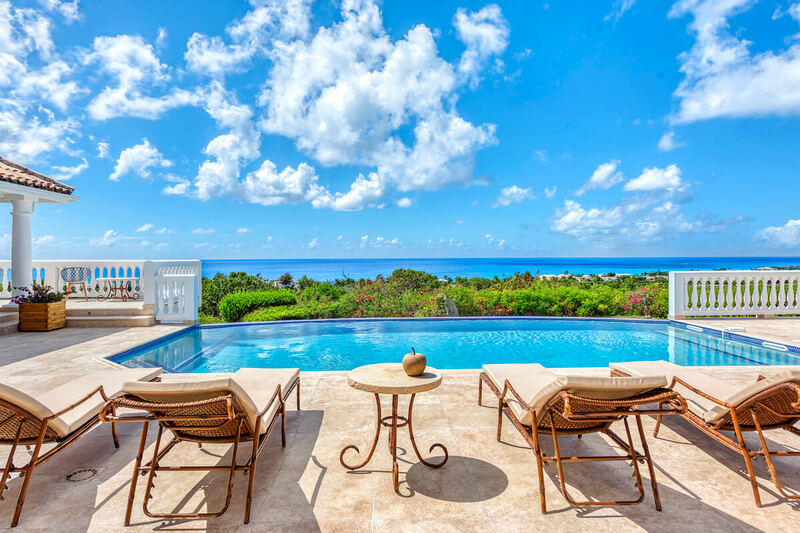 The expansive patio looks out at the view, with a pool that stretches across the middle. Loungers sit on one side, and a dining gazebo sits on the other. The patio features multiple living and dining areas as well as an outdoor kitchen. It opens to the living room, which has abundant seating and high ceilings. The gourmet kitchen wraps around the breakfast bar and features ample appliances and cookware. Each of the five air-conditioned bedrooms has a king-sized bed, ceiling fan, TV, DVD and CD player, and a safe. Each bedroom also has a private bathroom with a shower. Marigot is an 11 minute drive away, and the nearest grocery store is 6 minutes away. Baie Longue and La Samanna Hotel is 2 minutes away, perfect for spending the day oceanside. Long Bay Beach is a quick 2 minute drive.